Kenneth Sosa, Edgar rodriguez (drums) and Samantha Cabrera of Dr. LimB perform at the Philosopher’s Cabiret event inside the Great Hall at Pierce College in Woodland Hills, Calif. on December 5, 2011. The event had music, poetry and movies with the theme of philosophy.Photo: Javier Zazueta. The Pierce College Philosophy Club hosted the Philosopher’s Cabaret in the Great Hall. The event combined a variety of digital video, live spoken word and live performance, while highlighting the creative exploration of philosophical ideas. Student’s created and presented performances of up to five minutes on the theme ‘perspective’ on either artwork, photography, music, poetry or movies. Performances included original songs, skits, videos, poetry, and dance. 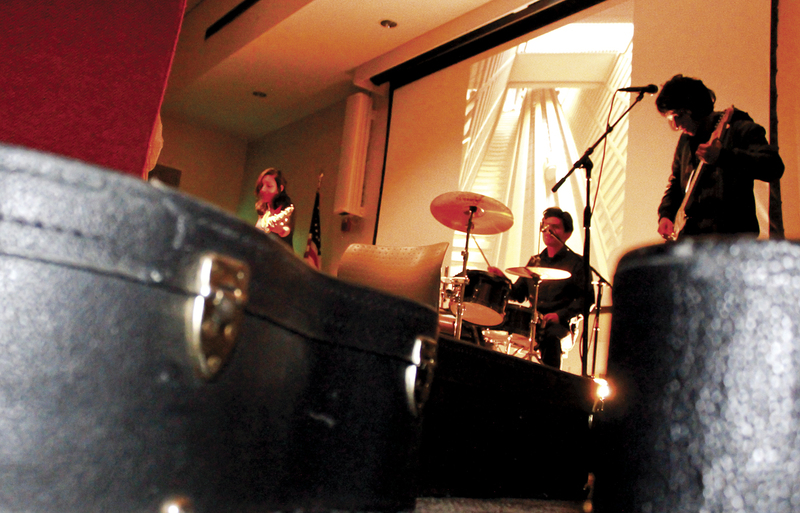 The musical performances ranged from 1920’s stylistic tones to contemporary rock and new age. Guitarist Raul Whitfield performed a song expressing the opposing ideals on happiness of the philosophers Aristotle and Plato. Student Bill McGary gave an informal presentation on the way the human brain processes its sensory input based on the different way each individual perceives visuals. “Our minds, as great as they are, do have shortcomings because we all see things in different perspectives,” said McGary. The Cabaret generated a strong audience turnout and each and every performance was applauded at its conclusion.